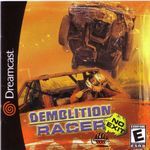 Technically a sequel to a little known PlayStation game, "Demolition Racer: No Exit" is a well thought out racing game where coming first isn't necessarily the best move to win. Mixing the ideas of a demolition derby with a regular racing game, players have to knock out competing racers & earn style points in how they do so, as well as the traditional racing aim of getting to the finishing line first. The single player gameplay consists of a career mode principally focused on the races described above. Incidental competitions include more traditional destruction derby events, "Chicken Runs" & "Suicide" modes. There are a number of unlocks available in the game's career mode, including a tennis minigame & a "Light gun" style shooting minigame, both involving cars.